Switching to a diet low in carbohydrates could see people lose up to 10kg over a three-year period, according to new research. A team of US researchers found that individuals on low-carb diets burned the greatest number of calories when compared to other types of diet. 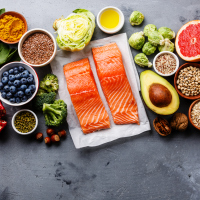 And authors of the paper, published in the BMJ, predict that the long-term benefits of the diet could be even greater if sustained over a longer period of time. A total of 234 overweight American adults aged 18 to 65 were enrolled in the study and placed on an initial calorie-restricted diet for a period of 10 weeks. This led to 164 participants losing at least 10% of their body weight over the initial period of the study. These people were then placed on either high, moderate or low-carb diets for an additional 20 weeks. Each participant was provided with fully prepared meals with a similar protein and fat content. The team of US researchers then tracked participants' weight and measured energy expenditure, which shows how many calories are burned. They found that total energy expenditure was significantly greater in participants on the low-carbohydrate diet compared with the high-carbohydrate diet. Participants on the low-carbohydrate diet burned 209 to 278 kilocalories a day more than those on the high carbohydrate diet - or about a 50 to 70 kilocalories a day increase for every 10% decrease in the contribution of carbohydrate to total energy intake. "If this effect persisted - and we observed no attenuation from 10 to 20 weeks - it would translate into an estimated 10kg weight loss after three years for a typical 30-year-old man of height 178cm (5ft 10in)," the authors wrote. The researchers, who are presenting their findings to the ObesityWeek 2018 conference in Tennessee, USA, concluded: "Dietary composition seems to affect energy expenditure independently of body weight. "A low glycemic load, high-fat diet might facilitate weight loss maintenance beyond the conventional focus on restricting energy intake and encouraging physical activity." Are you looking for insurance that meets your specific medical needs? Check out our range of dedicated medical travel insurance and find the right cover for you.